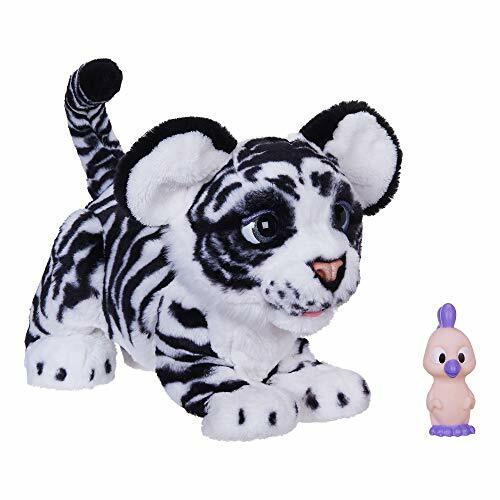 The furReal Roarin’ Ivory, the Playful Tiger Interactive Plush Toy is ready to play, and her favorite way to have fun is to ROAR! Roar at her or make a noise, she responds by roaring back! Incredibly realistic pet responds to sounds and touch with 100+ sound-&-motion combinations. Talk to her (or roar!) and she roars back. Pet her forehead, muzzle, or back and she responds with sounds and movement — she can move her eyes, ears, head, mouth, and tail! Pet this cuddly cub and watch her eyes close as she purrs. She crouches down when she’s feeling playful and moves her tail when she’s ready for fun. It’s fun to watch her lean down and pose playfully as she lets out a big ol’ roar! She even has a cute little chicken toy that she reacts to — just place it in her mouth and press down, and watch her respond! And with poseable back legs, she can be hugged and cuddled. (Clicking sounds when her legs are moved are just fine.) This is one fun-lovin’ — and loveable — jungle pet for kids ages 4 and up. furReal and all related characters are trademarks of Hasbro.